These three images taken by NASA’s Hubble Space Telescope reveal a disk of previously ejected material around an erupting star being illuminated by a torrent of light unleashed during a stellar outburst. 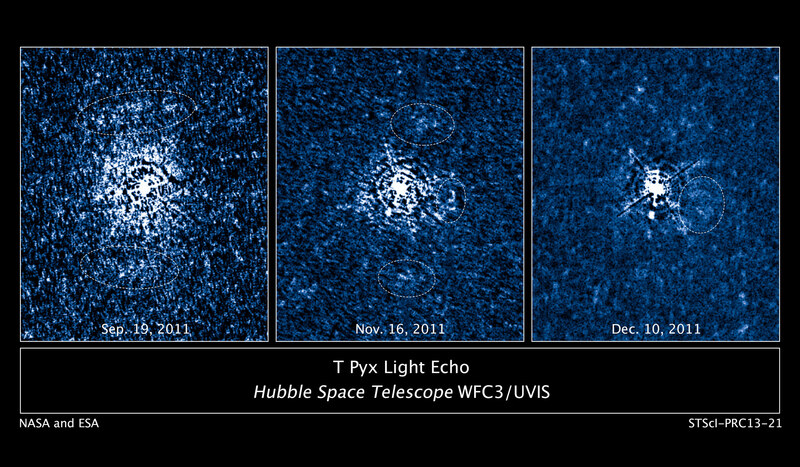 Hubble’s Wide Field Camera 3 imaged the double-star system T Pyxidis, or T Pyx, over a four-month period. T Pyx is a recurrent nova, erupting every 12 to 50 years. T Pyx’s latest outburst was in April 2011. The star is the white blob in the middle of each image. T Pyx is located 15,600 light-years away in the southern constellation Pyxis, the Mariner’s Compass. The images were taken Sept. 16, Nov. 16, and Dec. 10, 2011. Using NASA’s Hubble Space Telescope, astronomers used a flash of light from double-star system T Pyxidis to probe for the first time the 3-D structure of material ejected by an erupting nova. Washington — A flash of light from a stellar outburst has provided a rare look at the 3-D structure of material ejected by an erupting nova. 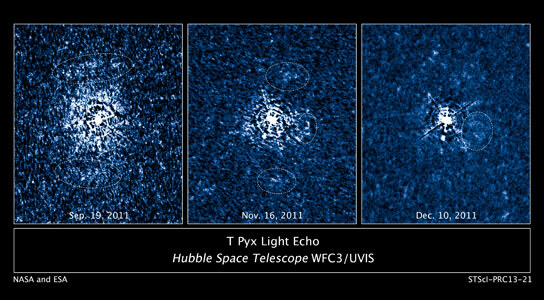 Astronomers used NASA’s Hubble Space Telescope to observe the light emitted by the close double-star system T Pyxidis, or T Pyx, a recurring nova, during its latest outburst in April 2011. Contrary to some predictions, the astronomers were surprised to find the ejecta from earlier outbursts stayed in the vicinity of the star and formed a disk of debris around the nova. The discovery suggests material continues expanding outward along the system’s orbital plane, but it does not escape the system. Team member Stephen Lawrence of Hofstra University in Hempstead, New York, will present the results Tuesday at the American Astronomical Society meeting in Indianapolis. Team member Jennifer Sokoloski, also of Columbia University and co-investigator on the project, suggests these data indicate the companion star plays an important role in shaping how material is ejected, presumably along the system’s orbital plane, creating the pancake-shaped disk. The disk is tilted about 30 degrees from face-on toward Earth. 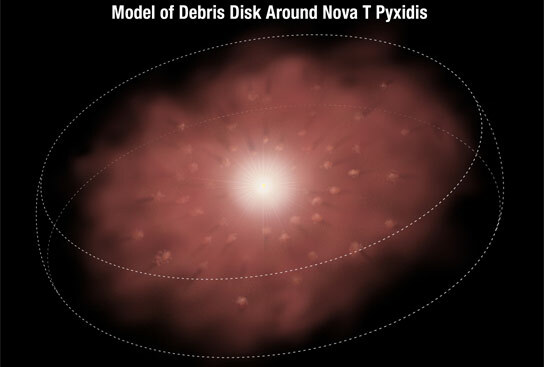 This illustration shows a disk of material ejected by an erupting star, called T Pyxidis, or T Pyx. T Pyx is a recurrent nova, erupting every 12 to 50 years and ejecting material that has formed the disk around the bright star. The disk is full of clumps of material that have comet-like tails pointing away from the star. Using Hubble’s Wide Field Camera 3, the team took advantage of the blast of light emitted by the erupting nova to trace the light’s path as it lit up the disk and material from previous ejecta. The disk is so vast, about a light-year across, that the nova’s light cannot illuminate all of the material at once. Instead, the light sweeps across the material, sequentially illuminating parts of the disk, a phenomenon called a light echo. The light reveals which parts of the disk are nearer to Earth and which sections are farther away. By tracing the light, the team assembled a 3-D map of the structure around the nova. Although astronomers have witnessed light propagating through material surrounding other novae, this is the first time the immediate environment around an erupting star has been studied in three dimensions. Astronomers have studied light echoes from other novae, but those phenomena illuminated interstellar material around the stars instead of material ejected from them. The team also used the light echo to refine estimates of the nova’s distance from Earth. The new distance is 15,600 light-years from Earth. Previous estimates were between 6,500 and 16,000 light-years. T Pyx is located in the southern constellation Pyxis, or the Mariner’s Compass. The team is continuing to analyze the Hubble data to develop an outflow model. T Pyx has a history of outbursts. Besides the 2011 event, other previous known eruptions were seen in 1890, 1902, 1920, 1944, and 1966. Astronomers call erupting stars novae, Latin for “new,” because they abruptly appear in the sky. A nova quickly begins to fade in several days or weeks as the hydrogen is exhausted and blown into space. The team also includes Helena Uthas of Columbia University. The team’s results will appear online June 5 and will be published in the June 20, 2013, issue of the Astrophysical Journal Letters. Sokoloski is the paper’s lead author. Be the first to comment on "Hubble Maps 3D Structure of Ejected Material from Erupting Nova"